Today, we welcome Kat from SassyCat's Books Review! 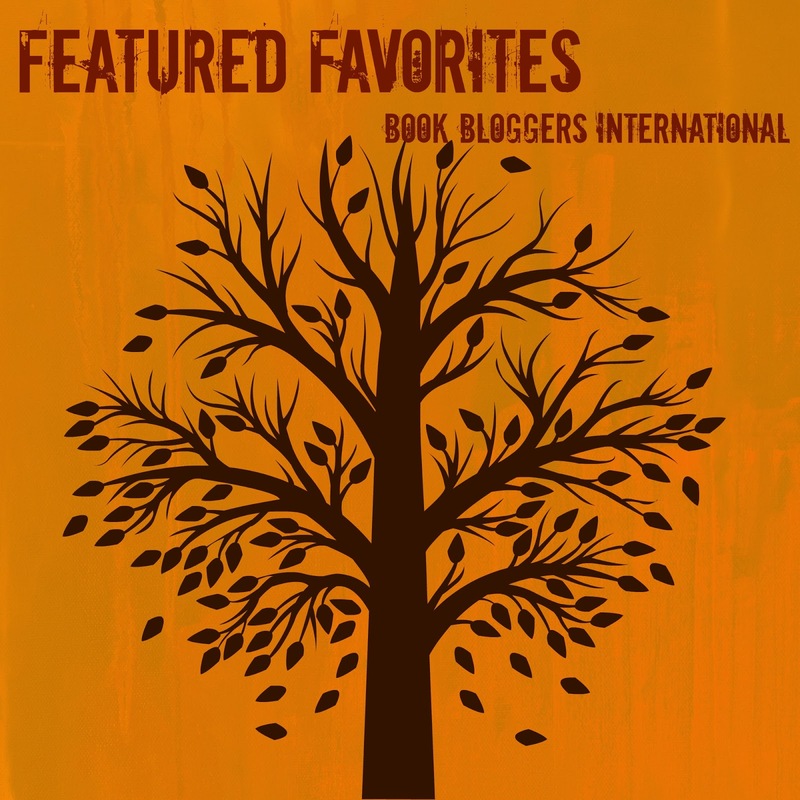 She is here to share her love with us about one of her favorite authors, Rachel Vincent. Read on for more! Why do I love her so much? Well maybe because she was the next author I’d probably read after Twilight and that was in 2009. I actually discovered her in two ways, one after Twilight WEREWOLVES were a huge thing but I was like “couldn’t there be cats?” and after doing a cat-shifters search on Goodreads I came upon her. I also learned that I had read some of her YA Soul Screamers book but never really thought about it. I’d sometimes pick up books and don’t remember why I picked it or when I picked it. I fell in love with both her YA and Adult books, but what had saddened me as a newbie addicted reader was that her werecats shifters has just ended. Alpha came out in October 2010 and I started her books in 2011. Her werecats shifters were the first Urban Fantasy/Adult book I have ever read and I’m glad I did because that opens up lot of window of books for me to read. Her YA series Soul Screamers was something I had to reread the first three books because I couldn’t remember a single thing about them and by that time Rachel was anticipating My Soul to Steal to come out in 2010. Between the two series that I had read so far from Rachel, Soul Screamers is kind of was closer to age with me at the time of reading or my mentality was still in that stage and age. I started college in fall of 2009 so the transition out of high school wasn’t too far away. 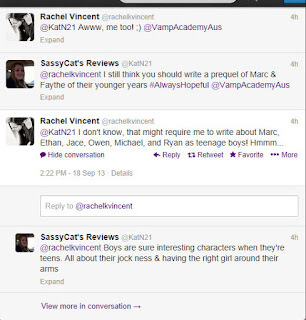 Why I would recommend for people to read Rachel Vincent’s Books? She did CATS . . . CATS!!!! There’s not really a Love triangle in any of her books (so far) but I think she doesn’t like the idea. The only time I worried was the whole Nash/Kaylee/Tod situation from the soul screamers. But once she clearly explains the situation and how my opinion on the matter at the time showed that there wasn’t ever really an triangle love story. What about her other books? Well I still fell hard for them too; her Blood Bound series was quite something. I’ve never read anything like that where people were bound by an oath or a blood oath, seriously it’s almost chilling to hear and read that some of the characters are bound to their boss and basically have no control over it. It’s also a duo POV one of the female characters that are the protagonists of the story and male characters that are the love interests. However there’s a twist in the trilogy that is set among the female characters in the books, they’re best friends and one of them had the skills/gift of bounding and accidentally bound all of them together. I wish Rachel wrote a short story on one of the girls and you’ll understand why I think that when you read Blood Bound which is the Olivia and Cam story. Her new YA The Stars Never Rise is really brand new, the first book came out in June of this year and her Menagerie ADULT book was just released late September. The Stars Never Rise is really fitting for anyone that loves Supernatural and/or The Walking Dead. Menagerie has lots of extensive details; more details than I think Rachel have ever done with all of her other books. It brings out the worst in human nature and it also brings out the mysterious world that we don’t see behind the curtains. 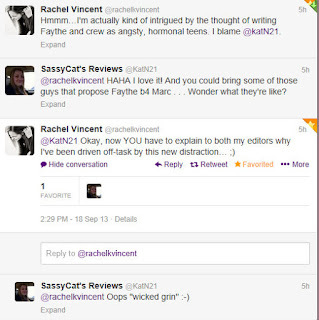 Rachel wrote a New Adult/Romance set from the Werecats world (FINALLY) five years after Alpha had ended in 2010. Lion Share is based on Jace Hammond and Abby Wade, her future plan for this NA/Romance is to continue self-publish with new characters for each book. It is not solely focused on Jace Hammond and Abby Wade but they will make an appearance in the rest of however many books she plans to write. 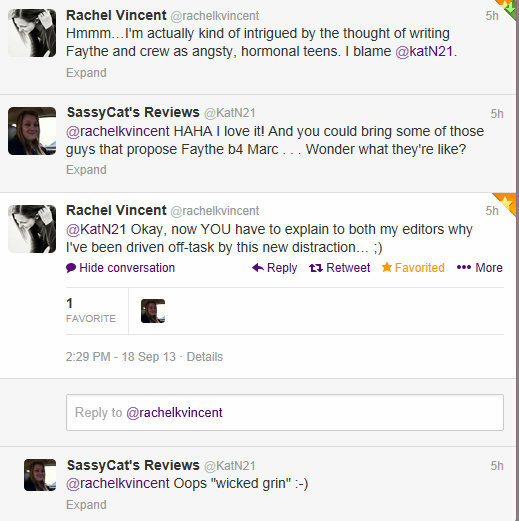 I’d even started a twitter rave when I suggested to Rachel that she should do a YA of the Shifter world and of course her mind was like “Raging teenage catshifters hormones! !” Here’s how the twitter went down, she might still consider it but I know she’s busy with all of her other committed works. PICTURE of my Collection; there are a total of 36 books. There’s a reason why I have so many Soul Screamers copies. One the complete set of seven books are my read-only books with the original covers before they switch it to the volume sets that is on the first row. 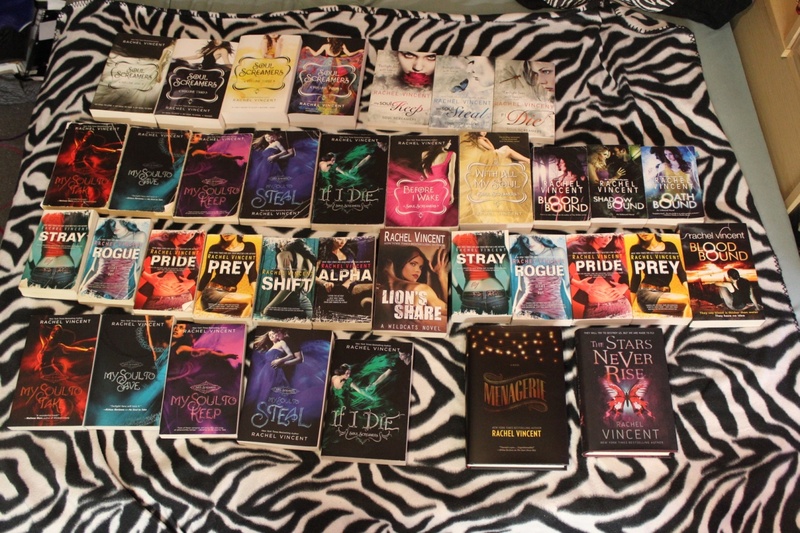 Second set that only goes up to IF I DIE (bottom row) sets I won from Rachel when I entered a contest, YES they are signed so they are my signed copies, I am planning on hunting down the last two books to add to that collection. The Foreign edition that is on the top row as well are books I purchased because the UK editions are just gorgeous for the Soul Screamers books. Yes I’m planning on finding the rest of book one and two, then book six and book seven. 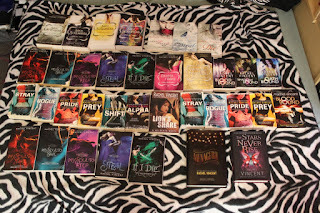 Now the Werecats shifter books (second row) the first six are my first copies and also read-only copy. They got pretty worn out and the edges are showing creases as well the binding, that how much I love the books and how often I had opened the books to read them. With this series have been nearly ended for five years, the books were becoming less and less available in the stores. But I manage to find and buy the first four books as my collection copy, but to find Shift and Alpha I can imagine I’ll be paying more than it is marketed. But it will be worth it! The Blood Bounds series (three books, in the second row) suffers the same fate as did my read-only copies did but the stores for whatever reasons didn’t obtain many copies but I think if I go online I can easily find them. They’re not that old like a 10 year span old maybe 3 or 4 years old? The cover of Blood Bound is UK edition (in the third row I also won from Rachel). The next two books of that series also have a different cover and also a different theme because Mira Ink marketed it a little different with the covers so I’m not sure how easy it would be to find the UK edition cover I have of Blood Bound. Menagerie and The Stars Never Rise are the newest book releases by Rachel, it has been nearly a year since a book of hers came out. 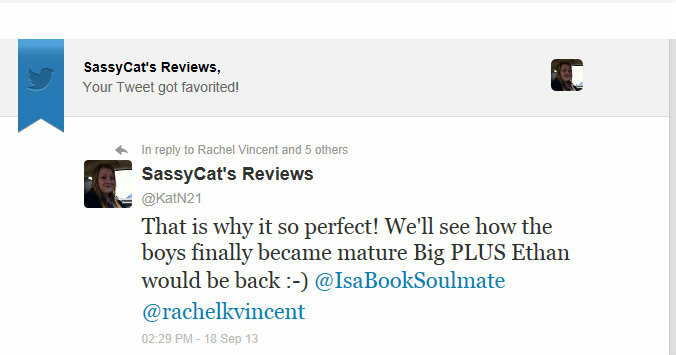 You have definitely made me interested in reading some Rachel Vincent!! 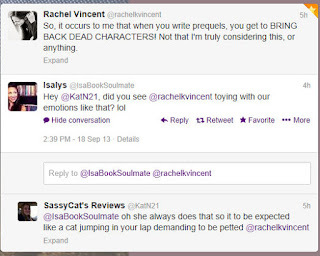 I've never heard of Rachel Vincent before, but just the fact that she writes about cats makes me want to read her. Werecats kind of remind me if Michael Jackson's Thriller too :) Thank you. Get book blogging news, events, and links every month with our newsletter! 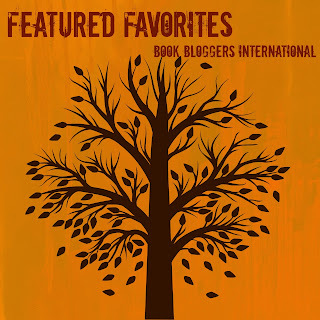 Introducing a Month of Featured Favorites! !